And the phone came out of my diaper bag. Click, click, click. Today’s “Picture Parable of the Week”. When King David craved to host the Presence of God (within the Ark of the Covenant), he pursued it (see 2 Samuel 6). No one asked him if he really wanted it. He didn’t go to church to get it. He didn’t wait for a sermon to hear about it. Upon receiving the Ark of the Covenant, he danced in the streets undignified before God. His wife was a bit “salty” (remember that from last week?!) But David was overjoyed! In fact, David was so overjoyed that he threw a party! A party with party favors: a loaf of bread, a cake of dates, and a cake of raisins were given to each person (see 2 Sam. 6:19). 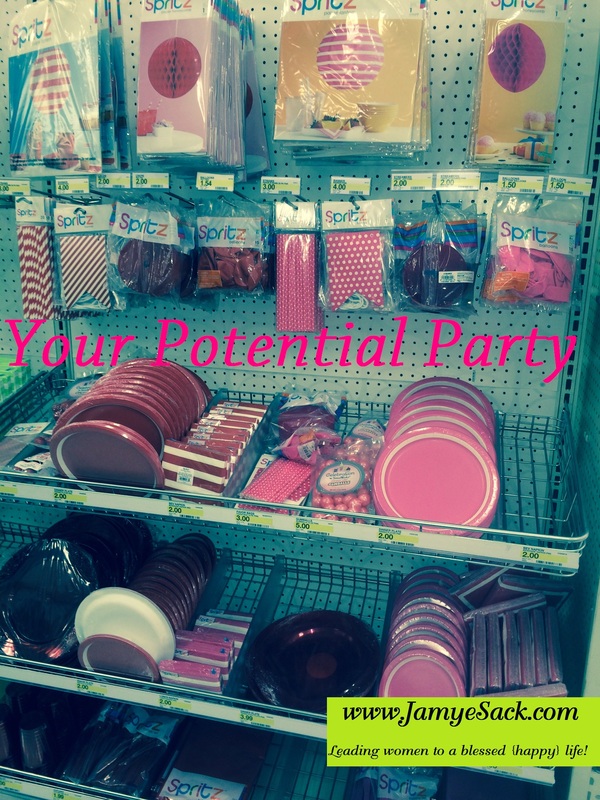 When I saw those perfectly wrapped party supplies in Target I realized that that’s exactly how we Christians can become if we are not careful. We know where to find it, we know how to get it, we could afford it anytime, but…we just don’t have time for it. We are content just knowing that it’s there but we aren’t taking the time to put the party up! We aren’t taking the time to unwrap them, and decorate our day with His Presence. Jesus Christ has paid for all our party supplies! As Believers, we have been given the greatest Gift of all-the person of the Holy Spirit; God Himself to be with us and in us (see John 14:17)! Yet too many of us go through the hours of our day negligent to hosting His Presence. Let us not become Believers who know there is a “potential party”, but Believers who take the time every single morning to unwrap and decorate our heart with His Presence. How about you? What do you think of when you see a party in a package?